If you’re tired of making those instant potatoes from the grocery, it’s time to use your very own potato masher. Instead of powder, you get to use real fresh potatoes and the flavor is authentic and meaty. Potatoes are great sidings for almost any main dish. You can do a lot with them and make them flavorful and healthy. If you want, for those special occasions, you can also add a little sauce or gravy to make your mashed potatoes even more delicious. If you’re looking for ideas, here is a great garlic mashed potatoes with pepper cream gravy recipe. For your main dish or meat, you can use this best bbq rub and follow this guide on how to cook ribeye steak. But how do you choose which potato masher to buy for your kitchen? You need to consider the ease of use and functionality and our list will help you look at those factors. 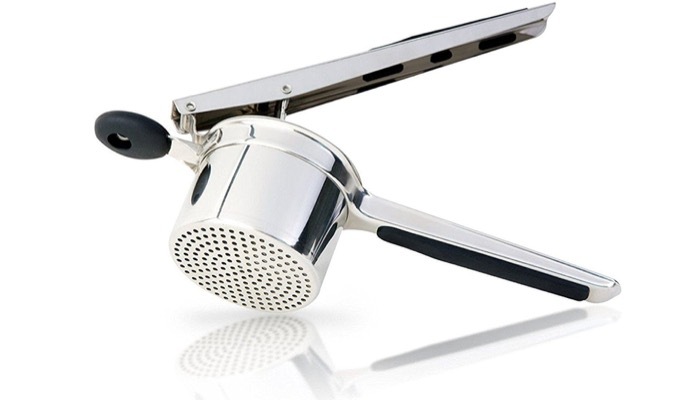 Our number one choice is the KUKPO Stainless Steel Potato Masher with Broad and Ergonomic Horizontal Handle – Fine-grid. It aims for convenience and effectiveness so that you can mash your potatoes under gentle pressure without tiring yourself. This will also save the potato from smashing while you mash. It prevents the potatoes from slipping around. The wide mashing plate allows you to exert minimal effort and it has a grip handle. It’s also easy to clean under tap water or mildly hot water. It resists fungi development from potato residues. 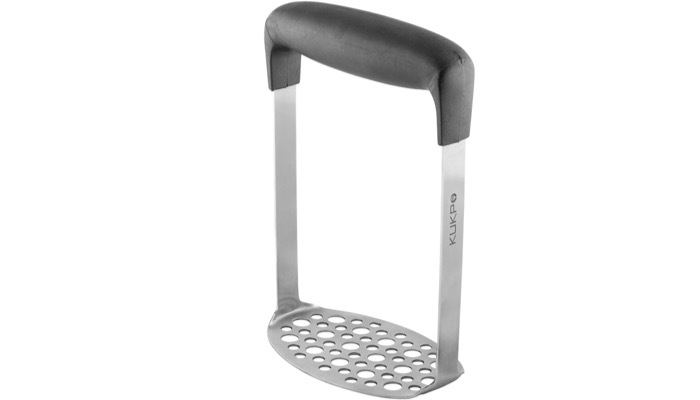 Our next top choice is the OXO Good Grips Stainless Steel Potato Masher with Cushioned Handle. It features a sturdy stainless steel wire head and a cushioned handle that absorbs pressure while you mash your potatoes. You can also use it for mashing yams, carrots, and other root vegetables. You can even use it to make baby food by mashing apples or bananas. For blending baby food, here are the best blenders for baby food. It has a large handle opening that you can use for easy hanging so it’s very easy to store. It’s also dishwasher safe. 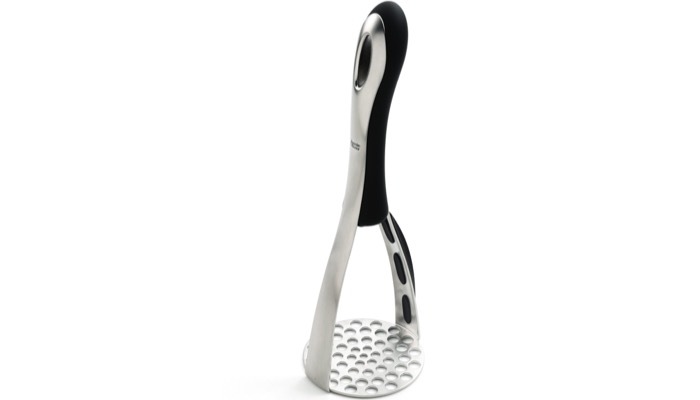 If you want the professional grade tool, here is the JAMIE OLIVER Stainless Steel Masher. 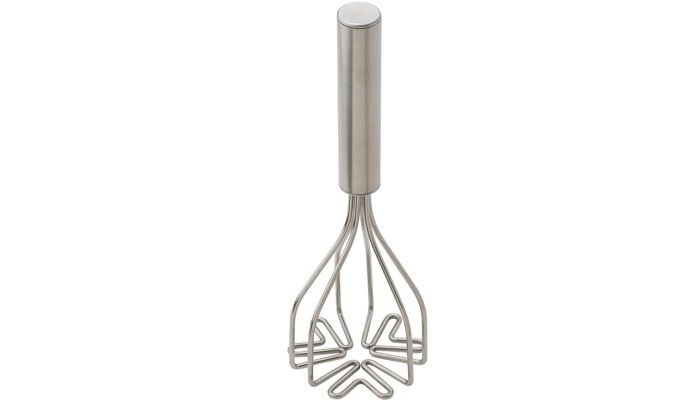 This is the potato masher from Jamie Oliver and DKB household. It creates just the right texture. It’s sturdy and has two size holes for quick mashing without leaving any lumps. It also has a built-in silicone bowl scraper so you can remove everything you mash out of the bowl. The construction is durable with a bushed stainless steel and a soft grip handle that allows comfortable use. You can use it for a wide variety of everyday tasks for many recipes including root vegetables. A great versatile option is the HIC Two in One Potato Masher Mix N’ Mash. It has a special design to mix and mash softer foods in a single cooking utensil. This is great for potatoes, yams, cauliflower, pumpkin, turnips, apples, bananas, and even hard-boiled eggs. It has a special shape wires that scrape down the sides of bowls and pots while mixing and mashing. It processes very consistently. The stainless steel construction is sturdy and durable and will never rust. It’s easy to use and to clean and is dishwasher safe for thorough cleaning. 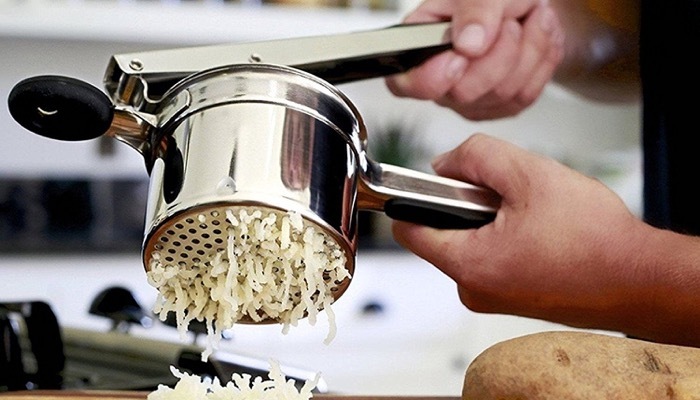 A more unique and non-conventional alternative is the PriorityChef Potato Ricer and Masher, 100% Stainless Steel. 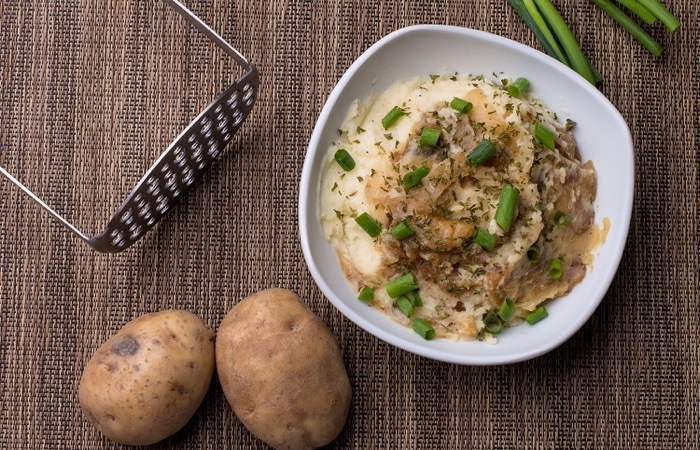 It helps you create light and fluffy mashed potato perfection at half the time and the effort. It’s 100% stainless steel which is stain resistant and rust proof. 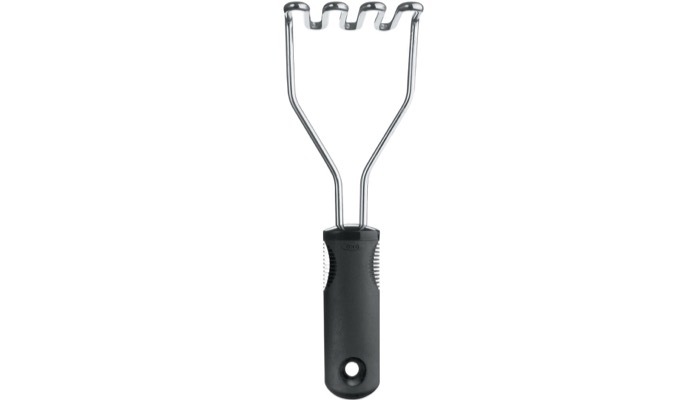 This potato masher makes short and easy work for an otherwise tedious mashing. The handle has a comfortable cushion and ergonomic design so this is also a great relief for people with arthritis. It’s multipurpose and will also allow you to make juices. A great simple and affordable alternative with great quality are the Good Cook Classic 9-Inch Chrome Potato Masher. It’s a classic masher with a triple chrome plated shank. A disadvantage to some people may be that the handle is a molded plastic but it has an extra strong construction. The head has an ideal shape and pattern perfect for mashing potatoes to your preference. It also works well for other vegetables. The great thing is that this is also dishwasher safe so it’s very easy to clean and maintain. There are different types of a potato masher and they come in different styles, shapes, and sizes. Choosing one will depend on the consistency that you want for your potatoes and how much you want to make. The very reason you are buying or using a potato masher is that of its mashing plate. This is what will mash and crush the potatoes. There are two types of mashing plates. There are a wave style and a perforated plate. The perforated plates are easier to use and create smoother potatoes. But if you want your potatoes to be a little bit chunkier, you can choose the wave style. 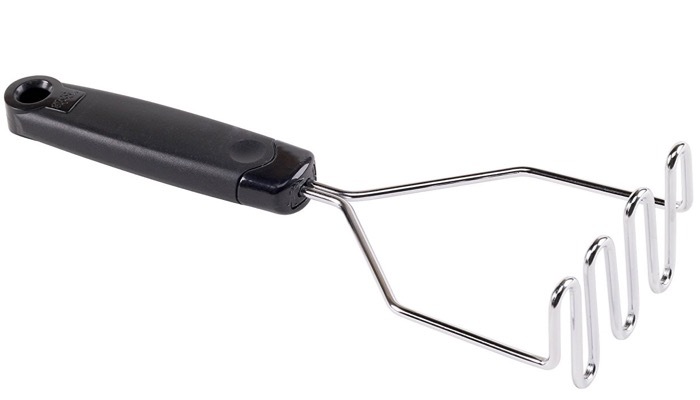 Your potato masher should have a sturdy and comfortable handle so that you don’t hurt yourself as you mash. Look for a handle that has a secure grip or one that has a silicone or nonslip rubber. It should have a sturdy construction otherwise it will bend easily while in use. Choose a potato masher with high-quality stainless steel because they are free from corrosion and rust. 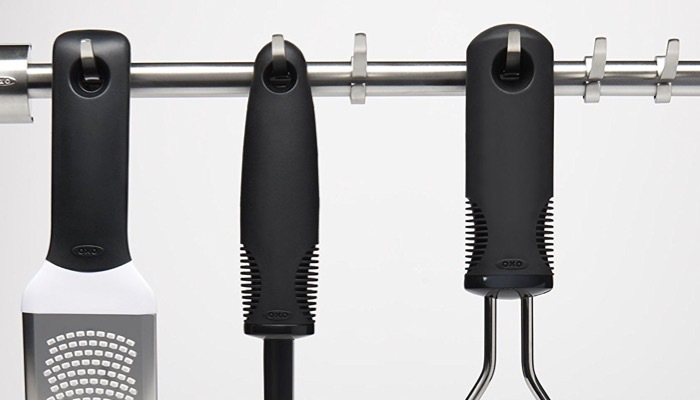 Look for a hanging hole that will enable you to store your masher in the kitchen rail. This makes storage so much easier. You need to consider the size depending on how much potatoes you want to mash. If you have a small family and you intend it for everyday use, it’s better to use a smaller potato masher. You also need to clean your potato masher regularly so make sure that it’s easy to clean and would be great if it’s dishwasher safe for thorough cleaning.